Heat plenty of water in a pot big enough for the pasta to cook freely. While heating, start cutting approx. 2 large heads of broccoli into bite size florets*. Thinly slice 3 good sized cloves of garlic. The thinner the slices the better. Find 1 dried red chilli. 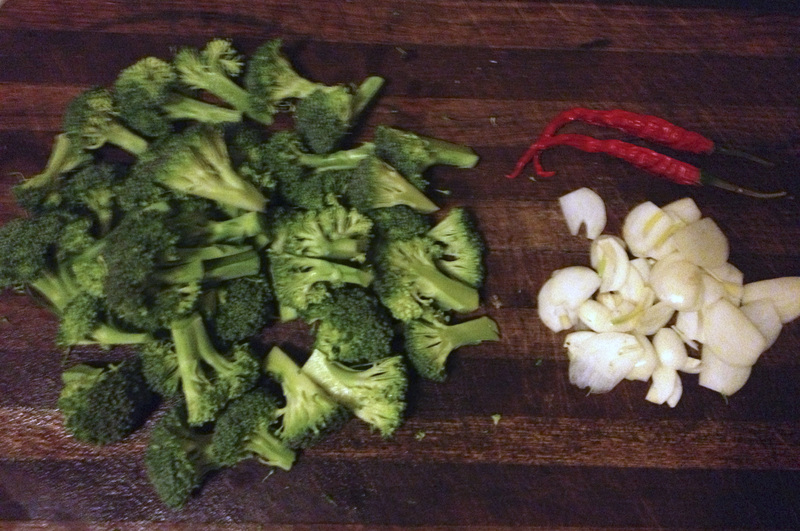 Thai is good, or Cayenne are less intense. Warm a good slosh of olive oil, 4 tbs or so, in a largish pan, on lowest heat possible. Throw in the garlic slices and chilli. The idea is to use the heat to infuse the oil with the garlic and chilli, not to cook or brown the garlic. Stir around so it doesn’t catch. Then, when it starts to colour, take it off heat (after about 5-10 mins). Remove garlic slices and chilli from oil and discard (or re-use in a stock). Put 500g of pasta – farfalle (the bow ties) seem to work. This is for 4 people. Put 6 – 8 large anchovies into the oil and turn up to med heat, stirring them through in until they start breaking up (exclude the anchovies for a vegetarian version). Add the broccoli florets and stir through making sure its getting all the anchovy/garlic/chilli oil goodness all over it. I find sprinkling a little water over helps to soften the florets a little. I like them still quite bitey. When the florets are done to your taste, turn off the heat. Drain pasta when it’s done. Splash some olive oil over the drained pasta in the pot. 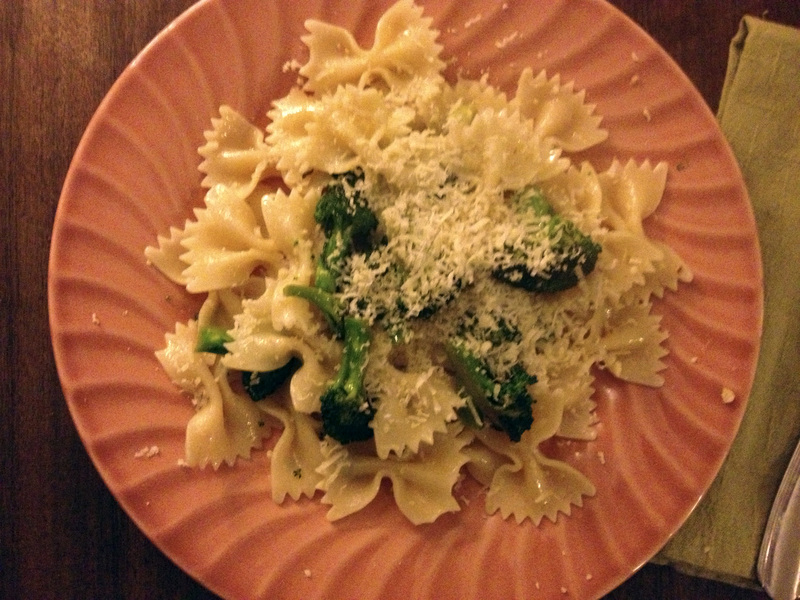 Throw the broccoli and juices into pasta and stir to combine together. Plate it and serve. Hopefully the person you asked to get the parmigiano from the fridge and put it into the hand grater around Step 7 actually did it. Take parmigiano and cram as much as you can into a hand grater. Put on table. Kids, ay? Cover in the aforementioned grated parmigiano and eat while experiencing a heightened state of being. *Save the stems and leaves of the broccoli for soup or to use in a stock.